It’s no secret that Chinatown’s got some of the hottest night spots in KL these days. It’s also no secret that we all love the excitement of speakeasies with their hidden entries and speciality cocktails. It’s not a secret (at least to those who know me!) that I, like many of you, enjoy a good drink. And it’s not a secret that The Attic Bar in KL has established itself as a great hidden escape for both food and drinks. So, what’s left to reveal? Not much, only the directions and a little bit about what you might find when you get there! Since there is no signage of any kind, finding a hidden bar is all about knowing where to look. The Attic Bar makes it easy: #followtheredlanterns. We start by finding the entrance to the Travel Hub, a single door that takes you up a flight of stairs to the lobby of a popular guesthouse. After asking the ‘concierge’ where to go, we are directed to more stairs, this time a very tall spiral staircase. I make a mental note to not wear heels next time, especially for the walk down! Red lanterns guide our path. With the hassle of a work day behind us, we are thirsty as we enter the narrow room endowed by exposed brick and soft red underlighting. Chinese themes grace the bar, and a cluster of cozy couches waits in a corner. We take a table and our host recommends a couple of options off the diverse cocktail menu. The complex Midsummer Night’s Dream (RM36) opens our evening with hints of rosemary and melon underscoring coconut and gin. With a foamy cap, this is a drink with layers, both to see and to taste. I enjoy peeling them back with each sip. In grand fashion, the stunning Dragon Lady (RM38) arrives next, a parade of deep purple hues and elegant orchids. I am immediately entranced; I’ve never seen a drink this color before, and it’s one of my favorites. This cocktail captures the tropics in vision as well as in flavour: passionfruit and lime blend with vodka and dragonfruit for a delicious drink that is fruity without being overly sweet. What makes The Attic Bar unique among the hidden bars in Chinatown is the addition of a food menu with full meals as well as snacks. DOP Italian Concept has partnered with The Attic Bar team to bring authentic Italian food developed by a trio of brothers from Italy. Eager to show us the full extent of the food options, Brother #1 starts the culinary conveyor belt from the kitchen. 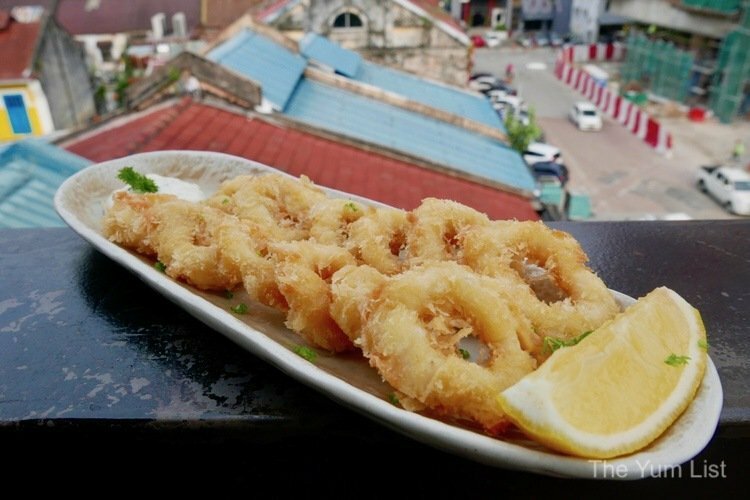 Crisp Calamari Rings (RM22) arrive first, battered in a blend of fine and rough bread crumbs to protect the texture of the fish without being too greasy or becoming too soggy. Designed for sharing, as most of the appetizers, it is not long before the rings disappear among hungry friends. They couldn’t really call it an Italian menu without that favorite sharing staple: Pizza. We sample two. First, a simple Margherita (RM11), the perfect way to showcase the homemade sauce, fresh herbs, stringy cheese, and dough that bakes crisp on the outside while remaining soft and airy inside. More sophisticated is the Truffle Ecstasy (RM18). 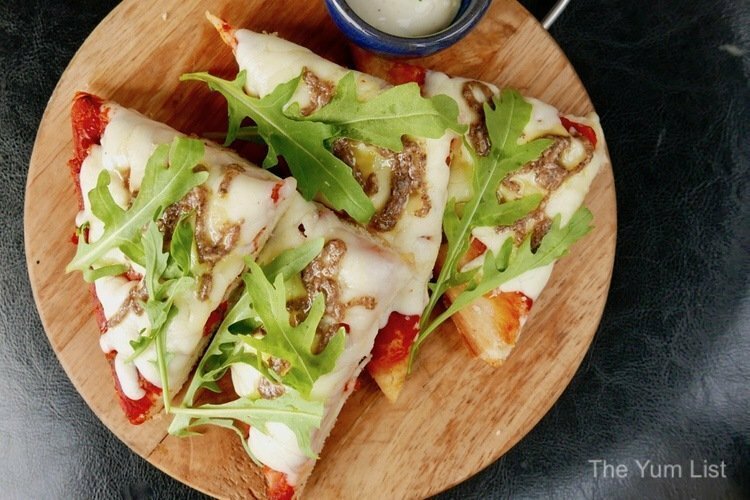 Topped with fresh arugula, vines of truffle paste spread across the top of the cheese enhanced by a little parmesan and cream, rich and delicious. 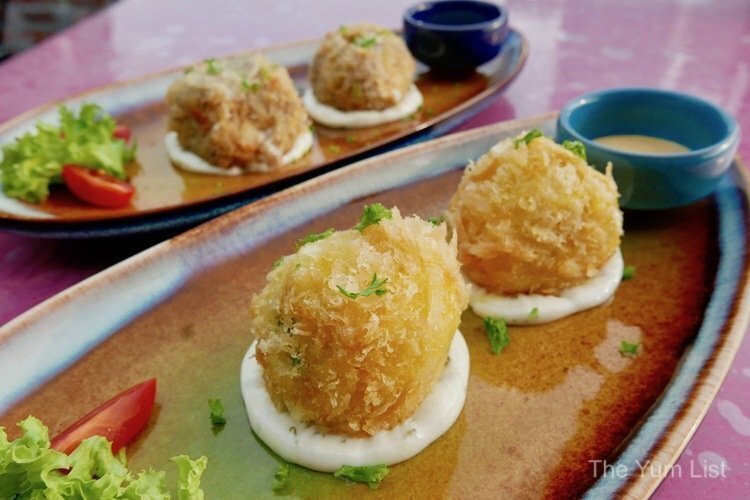 Crusty Arancini (RM18) arrive next, breaded rice balls crafted in three varieties. Following on the heels of the pizza, Monica prefers the truffle arancini, rich mushroom threaded through the rice. Caning loves the mozzarella variety, crispy exterior melting into hot strings dripping off the fork with each bite. My favorite comes spiked with saffron and peas, delicate flavors woven into the grains. Just goes to show that you can’t go wrong with whichever you order. 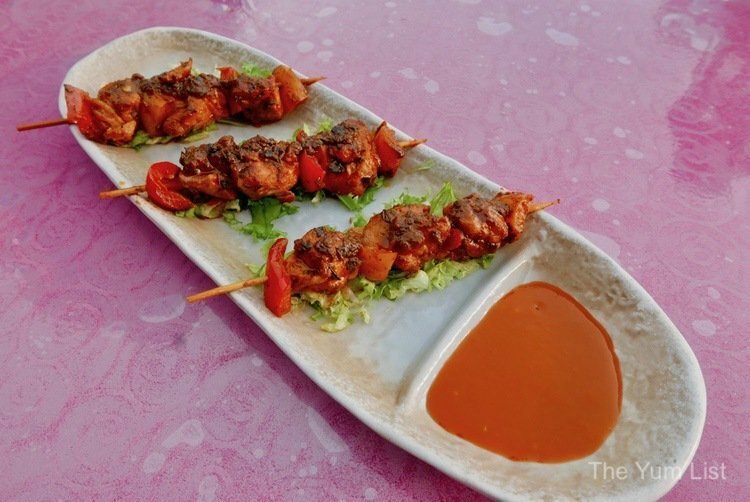 The last of the snacks, we sample the Chicken Skewers (RM18), leg meat marinated overnight in paprika, thyme and rosemary, then grilled with peppers. The cubes are flavorful and juicy, complemented by homemade BBQ sauce that’s just a little smoky with undertones of onion. The fraternal partners of DOP Concept also produce their own organic wines, at a vineyard in Italy. 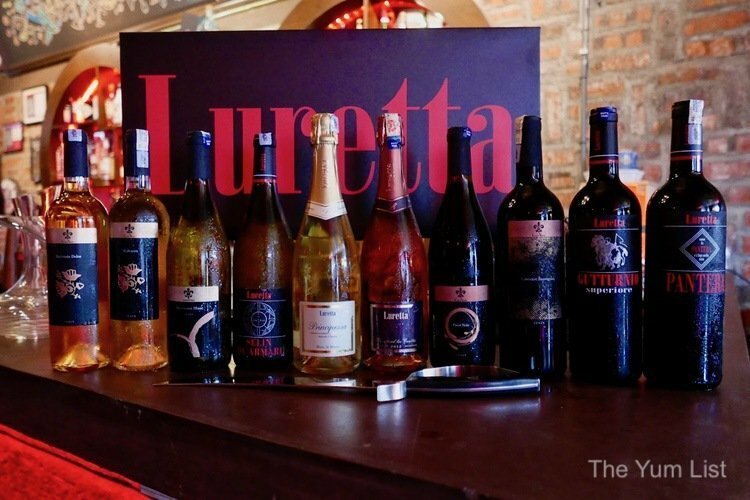 The full collection – from the more common Cabernet Sauvignon and Pinot Noir to more unusual Malvasia and Pantera blends – can be sampled at The Attic. We are pleased to take part in the opening of their sparkling wine, Principessa, by means of sabrage. Emil uses a blunt sword to slice off the top of the bottle with a grand swing of his arm. We erupt like the bubbles from the bottle with exclamations of delight! 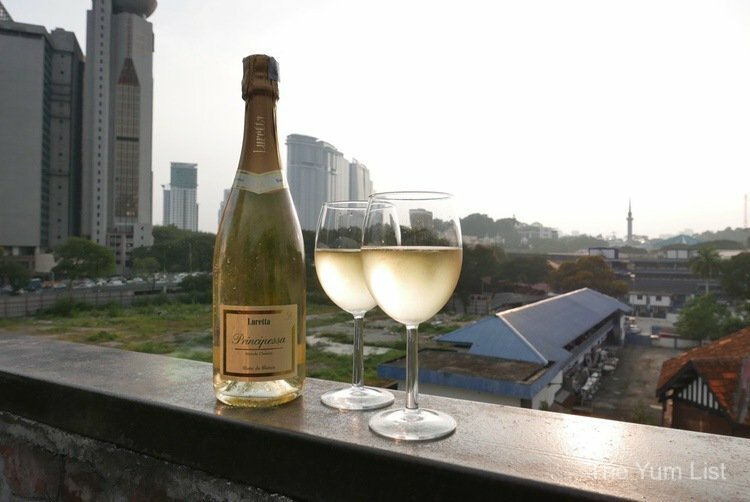 Standing on the terrace that opens off the back of the bar, bathed in the soft glow of twilight, with views of both the towers and the Chinatown roofscape, we sip light-hearted bubbles and watch the sun drop among new and old friends. As if our spirits and stomachs are not already full enough, it is time for dinner! DOP Concept offers an array of homemade pasta dishes and some homestyle mains. 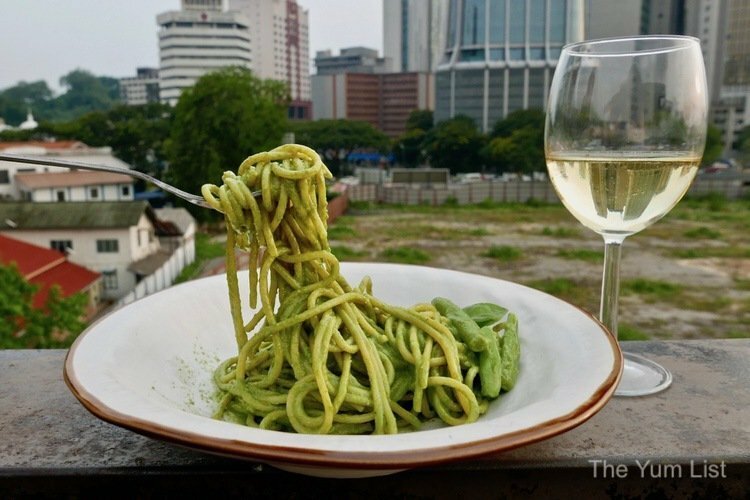 Spaghetti Green Days (RM26) tosses noodles in a light pesto and serves them atop a bed of green beans. Aromas of freshly plucked basil overlie the slightly creamy texture to the sauce, enhanced with cashew nuts and a little béchamel. It’s delicious. 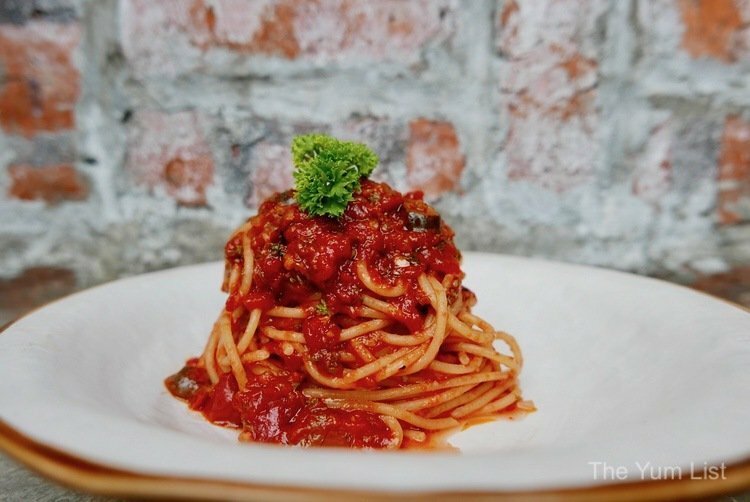 More robust from the pasta selection is the Spaghetti Puttanesca (RM26), a rustic tomato sauce spiked with fat chunks of olives and salty capers. The noodles are cooked to a perfect al dente and the sauce lingers with notes of chilli at the finish. Hungrier palates will be happy to find two meaty selections on the menu. 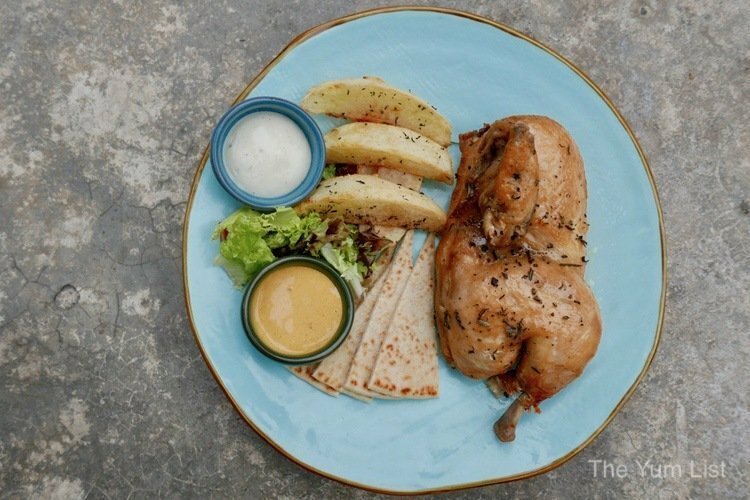 The Roasted Chicken (RM32) presents a tender half of a spring bird roasted with fresh herbs, served with potato wedges and DOP’s own curry sauce. 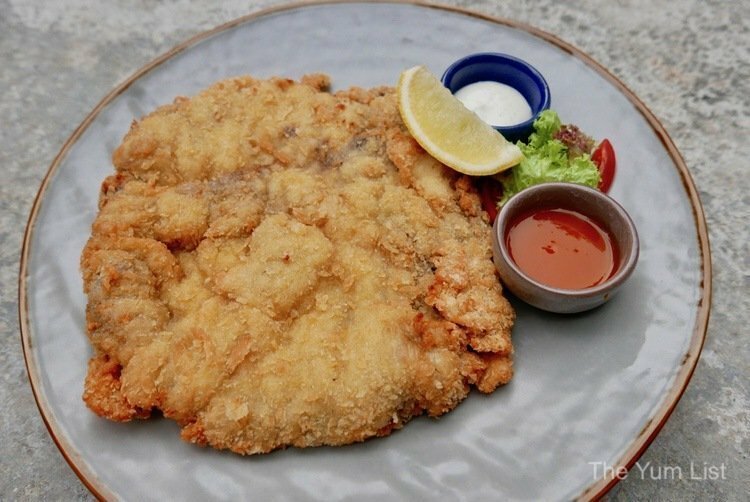 The Milanese (RM32) brings a plate full of tenderized beef, breaded like schnitzel. These hearty sharing mains will anchor stomachs for… more cocktails! The bar manager likes to experiment in the mixology department. 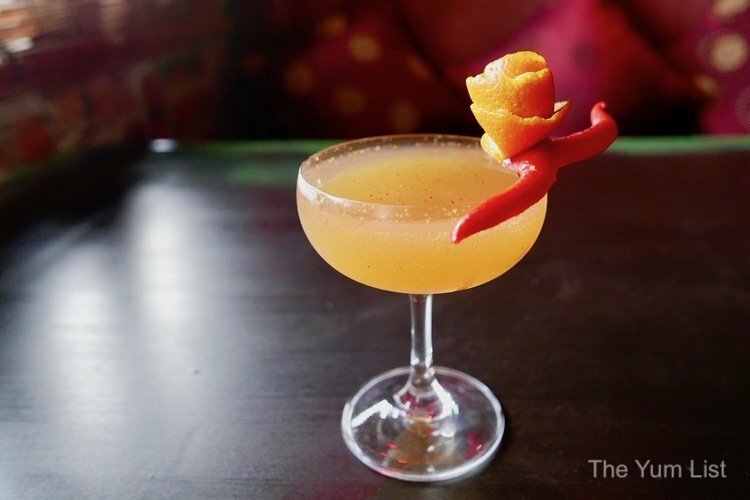 A creation that he spontaneously names Kiss Me Again blends tequila with passionfruit, pineapple and some chilli flakes to present a drink that looks tame but bites with spice and the smoke of agave. We love the moustache pepper that adorns the glass! 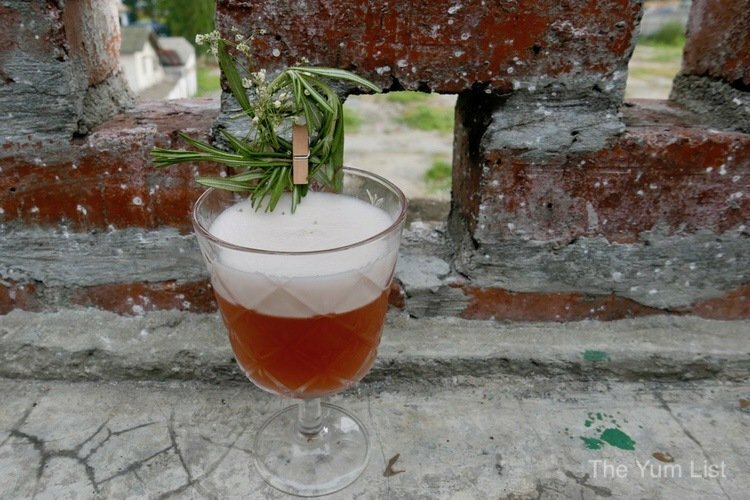 This drink gives us a window into the creativity and passion that lives among the bartenders at The Attic Bar KL. 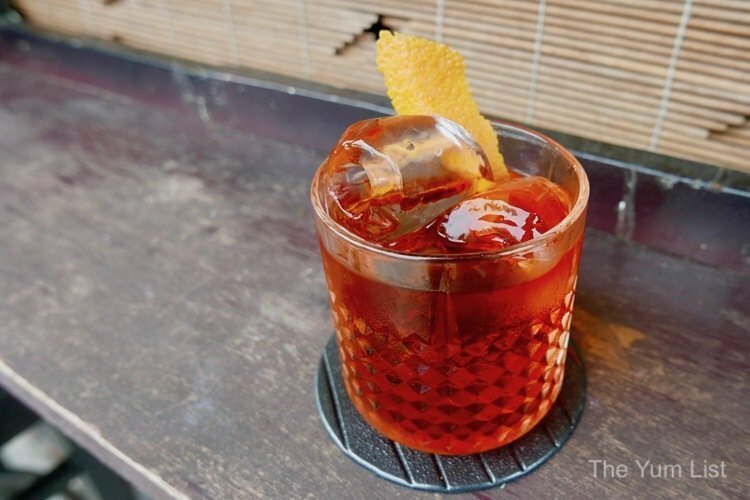 A Negroni is a drink that seems simple enough to make, but it’s the quality of the ingredients in the right proportions that make the drink special. The Attic’s Negroni (RM40) features Carpano Antica Formula Vermouth alongside gin and Campari for an exceptionally smooth cocktail with hints of vanilla around the edges. Not wanting to be stingy with our taste buds, we ask for a second round. Closing the night, DOP presents its homemade Tiramisu (RM19). Gorgeous layers of creamy mascarpone and spongy savoiardi are steeled by coffee and cocoa powder for a creamy, airy, rich piece of heaven. 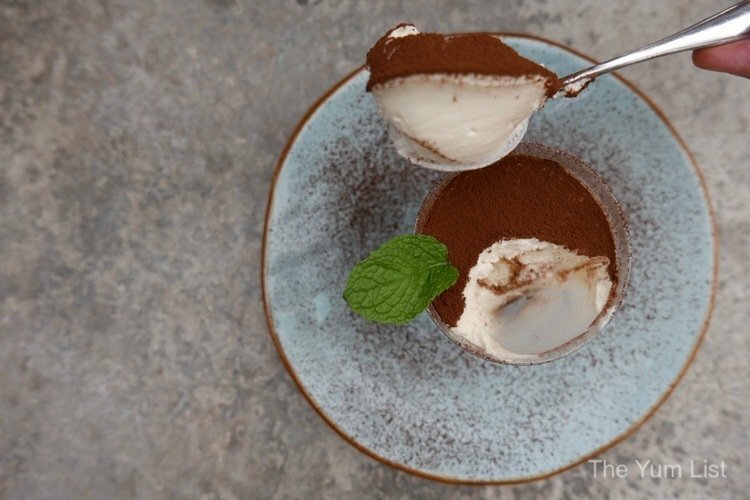 Could this be the best tiramisu in town? We wonder. 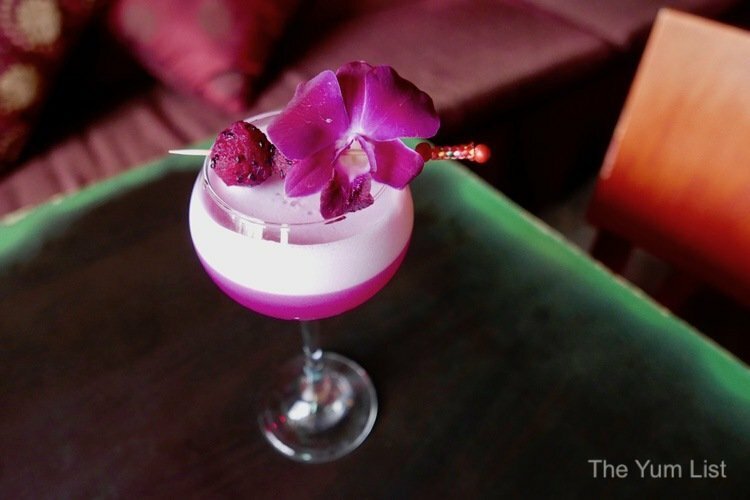 The Attic Bar in Chinatown is a terrific discovery, not only because it is hard to find but also because it is one of the only bars in the area to marry a substantial menu of delicious food with inventive cocktails. Extra special is the opportunity to enjoy the refreshments from a view-filled twilight on the terrace until late into the evening. Reasons to visit The Attic Bar: Authentic pork-free Italian food presented by DOP Concept in tandem with speciality cocktails. The Negronis, the pesto and the tiramisu were particularly good. Go at sunset to catch great views of the city at twilight and watch the sun drop behind the roofscape of Chinatown. Daily from 6:00 p.m. until 2:00 a.m., with later hours on Friday and Saturday. Find more on KL’s vibrant bar scene here. Yum! Yum! Nice tapas they have there! I could use one of those refreshing drinks/cocktails right now.